Whew. Moving to Switzerland is really getting in the way of my reading. I am wondering if I will pull off a challenge next year. Still debating even starting it. I am not going to make my 75 books this year, which is a bit of a bummer. Too much Europe exploring. 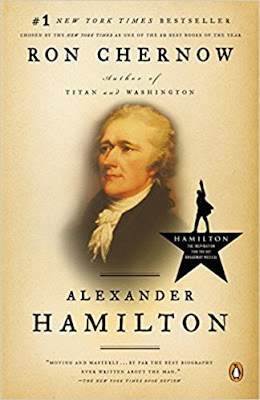 Alexander Hamilton - is there much I need to say about this man that you don't already know? Thanks to the musical "Hamilton" - a large part of the world is more familiar with him than ever. But in case you aren't - here is a quick recap: Orphaned boy whose mother was from Nevis and father who was Scottish. He was brought to America by a cousin and eventually ended up with a merchant family. He was known as an intellect from an early age. He studied at Kings College (which is now Columbia) and became a lawyer. He married Eliza Schulyer and they had 8 children. He worked very closely with George Washington, and fought on the front lines of the battle with Britian. He wrote the federalist papers. He cheated on his wife. His eldest son died in a duel. And then Alexander died in a duel with Andrew Burr at the age of 49. That about sums him up. Just kidding. That barely scratches the surface, so you should read the book. All 900 pages of it. The author very much idolizes Hamilton, and paints just about every other founding father as people who did everything wrong. Hamilton was no saint. He was brilliant - no doubt - but no saint. He was hot tempered and a womanizer. He spent long amounts of time away from his wife and children chasing battles and defending his Federalist papers. You do wonder - had he lived - what else he might have accomplished. It is going to be winter soon. If you are like us and need to hunker down to get through the cold, wet, snow driven months, then this would be a good book to pass your time.